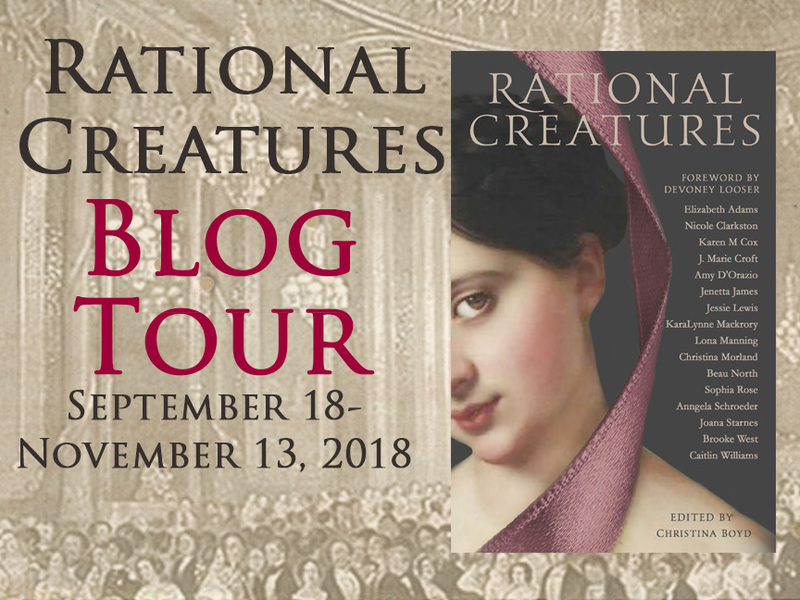 Welcome to another stop of the blog tour for Rational Creatures, one of the most expected books of the year not only because of its significance when it comes to the defense of feminist principles, but also because editor Christina Boyd was once more able to gather some of the most prominent names in the JAFF literary genre. I’m very happy to receive an author who is new in the The Quill Collective Anthologies but someone whom I’ve known quite well for the past years, Nicole Clarskton. Marianne Dashwood: the last girl in the world whose name you would accidentally breathe in the same sentence as the word “rational”. Marianne is introduced to us as exceedingly pretty, lively, engaging, witty, and talented. She is that girl who can hold the room in her thrall with hardly a conscious thought. She is, however, regularly given to excesses of passion—which even her mother encourages—that would eliminate her from the running if we were on the search for someone cool, calm, and collected. That laurel would go to her sister, and Marianne would suffer not a moment’s jealousy in being passed over for such accolades. Marianne is not without other virtues. She is honest and pure, and her definition of these qualities is exacting. She speaks no guile and expresses every feeling, every thought with heartfelt sincerity. Indeed, this charming trait is perhaps her greatest flaw, for the expression “think before you speak” would smack of artifice to her. Her feelings are passionate, loving, unreserved, and wholly ungoverned. Not only does she permit her emotions free reign over her thoughts and actions, but she encourages them, provoking herself to even greater displays of feeling and relishing every moment of the heights of rapture or the depths of despair. At this point, you might be asking why anyone would ever have the nerve to declare Marianne Dashwood a “Rational Creature”. I believe the girl we meet at the beginning of the story would even be offended by that appellation, and would immediately quote some poetry to better describe herself. But Marianne undergoes a complete reversal, marrying a stoic man twice her age and bewildering the reader who tries to thumb ahead to read the last pages without first knowing the arc of the story. She did give her heart away… shocking, I know. In truth, she tore it out of her chest and threw it at an unworthy rascal, who promptly dropped it like a hot potato when the choice was between her and money. What, then, is a girl to do? Not only has she lost that one soul in whom she truly believed she must find all her happiness, she has also been forced to acknowledge the fallacy of her ways in a most humiliating manner. To top it all off, she discovers that her sister—remember the rational one?—has suffered a similar disappointment but has preserved her dignity through it all. That must sting. Well, it turns out that our girl has a bit of sense bound up in that heart after all. After a life-threatening illness, she emerges a new creature. She is still our headstrong, generous, thoroughly enchanting heroine—the soul of a poet in the body of a bewitching eighteen-year-old girl—but she has learned the value of temperance. Moreover, she resolves to hone her own mind, to discipline her thoughts, and—most astonishing of all—to consider the possibility of life without a man’s ardent devotion. She resolves to be content in who she is, while exerting herself to improve and make amends for past wrongs. All this transformation is little more than a blip in Jane Austen’s last chapters. Our dear authoress leaves us to wonder, to doubt, and perhaps even roll our eyes. But then, she proves Marianne’s new outlook on life by telling us of her marriage to a man she had once deemed unmarriageable, and then going on to declare her happiness in that circumstance. No, she has not changed in essentials. Did you catch that bit about how her husband is even animated and cheerful because of her influence? But the fact that she has devoted herself to loving, and loving wholly, the man who was the most sensible choice, demonstrates that she has learned what her mother thought unnecessary and her sister despaired of ever seeing: she is now governing her feelings by reason. Indeed, she has become a Rational Creature. The Quill Collective is offering a huge giveaway to one very lucky winner! 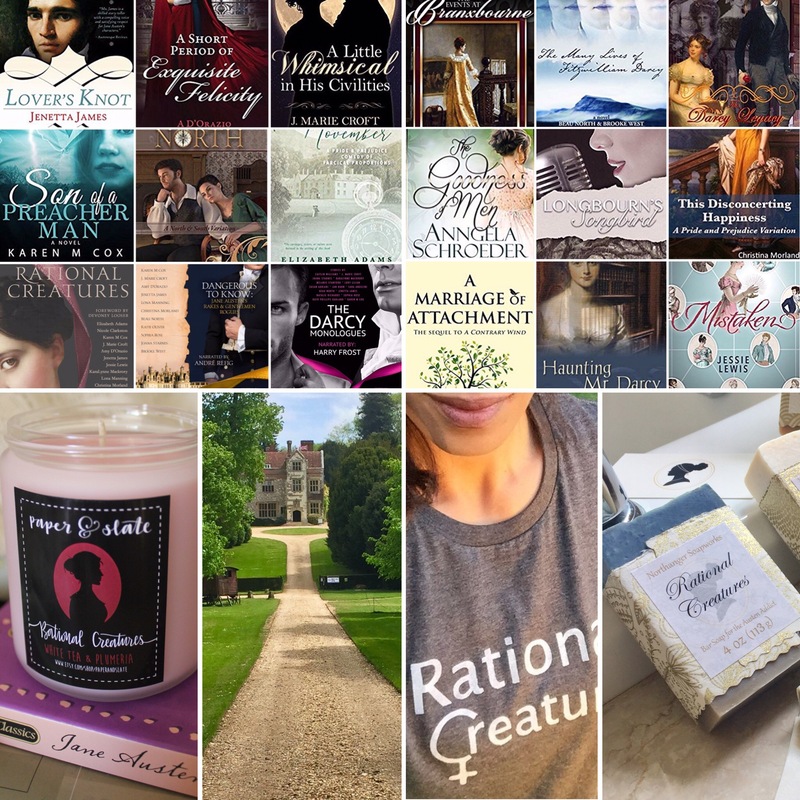 It is offering 21 prizes, so comment on the blog posts to enter and at the end of the tour you may be the randomly picked winner who will win all 21 prizes! The Quill Collective anthologies in ebook or audiobook. Thank you, Rita, for hosting this stop on our blog tour. More importantly, thank you for strenuously recommending the talented Nicole Clarkston to me as a potential “Rational Creatures” anthology author. She writes sentimental, emotive, thoughtful prose — who better to write Marianne’s story as she looks at herself and life with fresh eyes! I am very thankful for all these authors in this collection—and feel very blessed for their efforts in making this a top shelf collection. Great analysis, Nicole! Thank you. As always, you know your subject. Well done. Marianne Dashwood does not come to mind when I think rational – however….. I think Nicole’s story hits all the right notes. I’m hopeful you will like the collection. So glad you felt that way, Christina! I loved writing it. Well said and very true! I never disliked Marianne. I felt she was over the top at times and rude at others, and she let her heart and feelings run away to quickly with her. Maturity was still needed. She didn’t stop to think until her heart was shattered, and she had to pick the pieces of herself back up. With that came the hard lesson learned and rational entered. I am beyond excited to read what Nicole has created for our dear Marianne. I’m sure Colonel Brandon will be thrilled too! Yes, who hasn’t looked back on behaviors as a young person and cringed… I think Marianne Dashwood does grow—and though she remains spirited, I would imagine she matured quite a lot from that broken heart and near death experience. Nicole Clarkston does a wonderful job with Marianne’s enlightenment. I never thought Marianne would become rational as she started off totally romantically inclined, giving herself over to an unworthy man who made her believe in his false declarations. Luckily she decided to model herself on Elinor and this allowed her to realise how much more of a gentleman Colonel Brandon was. I look forward to reading Nicole’s version of Marianne’s story. How can we even compare what Marianne lost to what she gained? She’s like a kid whose taste matured from McDonald’a to gourmet French cuisine. It was fun to watch her grow up. Lovely essay. Yes she was dropped like a hot potato, how crushing! Marianne learned balance the hard way. I adore Elinor’s heroic and quiet strength and tsk at Marianne’s devil-may-care embrace of passionate expression. It’s her condescending attitude of those who exhibit reserve that I think reveals her unbalanced approach to life. It’s gratifying to see her appreciate and marry someone who loves as passionately on the inside but kept a reserved facade. I love stories about balancing heart and head, passion and reason — like N&S! I think she was stronger than she seemed at first, maybe even stronger than she ever wanted to be. Kind of like Margaret! Faced with a hurdle she never wanted to overcome, she surprised herself by how resilient she really was. I hope you all enjoy her maturing process. It was certainly painful, as none of it came easily or naturally to Marianne. However, doesn’t that prove her strength and resolve even more so than if she had been born level-headed and logical? People who learn the hard way are galvanized in the process, and have much to teach us. Thank you to Rita for hosting and to Christina for inviting me to join the project. I know you will all love this remarkable collection of stories, and I am so proud to be numbered with this spectacular group of authors! I first read Marianne as a dreamer, only to realize she wanted to live life to the full within the constraints of society and the limits of her own knowledge. Then I realized she had to be a smart cookie to go from believing herself in love, to the humiliation of realizing she was foolish in her affections, to learning what a true connection with a worthy man was all about. That she accomplished this while still so young is pretty marvelous. I found I liked her much more than Elinor who settled for a man with far less backbone and integrity. Go Marianne, you rational creature you! Most decidedly a dreamer! She reminds me very much of my bosom friend Anne Shirley, always searching for poetry and then finding that she really preferred beautiful prose all along. And what a heart she won! We should all be so blessed. It is true that Marianne is a tough sell as Rational Creature, but Nicole, you crafted a sequel that did exactly that. So poignant a story! Thanks so much for hosting us, Rita! Thank you, Sophia! What is it to be rational, really? Is it making boring decisions to be responsible, or hard choices to be whole? It’s probably different for everyone, but the universal factor, I believe, is a woman who has been seasoned by maturity and grace. I think Marianne grew up throughout Sense and Sensisablilty. It is hard to be at an age between a girl and a woman but in a world where you are expected to take on the responsibilities of a woman and in some ways give up who you are. She clung to that love of youth and life and her idea of love. I am so glad she found what love truly is through Col. Brandon. What a wonderful description! Yes, she, like so many other heroines I love who crashed and burned at first, defined love and life on her own terms and refused to be forced into maturity before she was ready. I am so looking forward to this book. As the tour continues… I can feel the excitement building. Thanks to Rita for hosting and thanks to Nicole for the comments regarding Marianne. And, special thanks to Christina Boyd for her skills in bring this all together. What a team!! Jeanne, I have had the pleasure of reading all the stories, and I can assure you, you are in for a treat! (Fans self) Thanks for stopping by! When I first read your statement of Marianne being rational, I couldn’t help but scoff. But I suppose by the end of the story she does demonstrate this quality after all. She certainly takes her time about getting there, doesn’t she! But she did have to earn that badge, and I think it makes her even more genuine for having done so. Thanks, Rita, for hosting Nicole and for your interest in Christina’s latest anthology. I’ve had the pleasure of reading Every Past Affliction already, and Nicole’s story convinced me Colonel Brandon will have a rational creature as his wife. Thank you, Joanne! I had to read your story twice before I caught all the nuances! Each lady has her trials, doesn’t she? Never make assumptions about the heart based on the surface. Thanks for letting the Rational Creature train stop here 🙂 I love how Austen can take a character with a glaring obstacle to happiness, like Marianne’s impulsiveness, and trace how that character grows and learns to deal with that obstacle. It’s the best purpose of fiction, and Austen writes it so well! She was an absolute mistress of the human mind, wasn’t she? I like to imagine Miss Austen as a people watcher, who spent hours upon hours dissecting the hearts and minds of her neighbors. I wonder who inspired each of her characters, and if the real-life “Marianne” ever foud happiness. Thanks for stopping by! Thanks for this lovely post, Nicole and Rita! I loved Marianne’s story so much! What a fabulous portrayal, Nicole! From the very first word to the last, Marianne stays true to herself, and the way she slowly discovers herself, her heart, and her love for Colonel Brandon is exquisite. And OMG, Col Brandon!! Love your Darcy and your John T, and I knew your Col Brandon will be to die for too. Be still, my heart, isn’t he just!! Thank you, Joana! I did develop a major crush on the Colonel while spending time with our dear girl. So glad you enjoyed it! This book sounds so intriguing! So many of the authors are favorites! Can’t wait to read it! I know you will enjoy it, Tamara! There are some spectacular stories in here, and they all stay true to the characters and the period. …she has learned what her mother thought unnecessary and her sister despaired of ever seeing: she is now governing her feelings by reason. Indeed, she has become a Rational Creature. I could have just left it at one paragraph! You narrowed it right down to the essentials, Denise. A woman’s sensitivity and passion, coupled with maturity and reason, can shape her into a being to be reckoned with. Thanks for stopping by! Denise, your ‘…she has learned what her mother thought unnecessary and her sister despaired of ever seeing’ is so thought provoking! It got me to thinking about people in real life like Mrs. Dashwood, who I wanted to shake sometimes and tell her to ‘check her’ (Marianne.) People who live vicariously through a family member, whose zest for life, risk taking adventuresome spirit, and youth, whose star they do not want to see dimmed. But to the point that some pulling down to earth at some time might have encouraged a more rational outlook. I’m not without fault here, myself. On the other hand, it’s horribly painful to see anyone you love hurt so badly as Marianne was. Thanks! I’ll think about that the next time I experience S&S no matter the format. So sweet of you to say, Maria! I am touched that you enjoyed it. I know you will love the anthology—many more happy sighs await you! Elinor might be perseved as the rational one. I think Marianne ends up with the better life/husband. Perhaps he was her rational choice but I like to believe it was a very good one. This book sounds so wonderfull! I know you will enjoy it, Charlotte! The ladies each found just what suited them, and both grew in the process. In fact, every lady in this anthology is remarkable for blazing her own trail. Lovely post, Nicole! Your words here, and your beautiful story, have made me think about how the ability to make rational choices really depends on our circumstances. When Marianne first meets the Colonel, she has just been forced to leave her home and move to a completely new place, and she is almost immediately teased about the Colonel by people like Mrs. Jennings, for whom she has little respect. When she meets Willoughby–well, we know all about that! We are all bound by our circumstances when we weigh the evidence before us. To borrow a phrase from the great Daniel Kahneman, ” What you see is all there is.” In other words, we trick ourselves into thinking we’re making rational decisions because we look at the evidence we can easily discover and then use it to decide without considering what we don’t know. Perhaps the mark of a truly rational creature is the ability to recognize this limitation, and then to try and overcome it by looking for evidence that is not immediately evident. I think this is what your Marianne ultimately does! Tremendously insightful, Christina! Absolutely, we make decisions based on the information and circumstances we have to work with. What is reasonable and prudent in one situation may be very different in another time and place. Thank you for posting this! I’m really looking forward to reading this anthology. I loved The Darcy monologues, there are some stories in it that I’ve read at least 5 times. It’s so nice to have great short stories to read when you’ve just got half an hour to read here and there! You made my day! Thank you for your generous words! You will love this one just as much. So many nuanced and descriptive moments in the lives of our favorite (and less favorite) ladies! It was fun to read each story and ponder what made each woman tick. I wasn’t going to comment because I’m coming to read this post so late in the game, but I guess I’m not the only one. I really just wanted to read what Nicole had to say, and read what has been for me the first blog I’ve seen devoted to RC. I’ve heard the buzz though, and I’m looking forward to reading it. What a collection of talent. What really prompted me to comment was this: Do we have the hubby going out of town or the renovation to thank for you writing your N&S variations? Whatever it is I’m so grateful for it. The last one, Nowhere But North, is a hand-to-heart, one huge sigh….I was left happily wrung out. I’m not sure what keeps happening here, but I haven’t been able to leave a reply to your post, Michelle! Maybe I’m talking too much. 😉 I am so glad to hear you are excited about RC. I know you will enjoy it, and it was a treat both to work with such a great team and to read the stories that came from it! As for your other question, yes, that’s exactly what happened! I would wait for my husband to leave town before starting a home improvement project just so he wouldn’t be there to tell me “That will never work.” Recovering furniture, painting, pouring concrete while pregnant… I admit, not all my ideas were brilliant ones. I had decided to rip out my carpet and refinish my floors. I had little kids, so I worked through the night, and I did it for a week straight, so I needed noise to stay awake. Enter Netflix on my laptop. The funny part is that I had low expectations of North and South when I pulled it up in my queue. I only tried it because Netflix recommended it based on the number of times I had watched Pride and Prejudice (but really, who counts that sort of thing?). In case you are wondering, I think I blew my P&P stats out of the water when I met John Thornton. Thank you so much for your sweet comment about Nowhere But North! That was a tough and special book for me, and I am touched that you enjoyed it. Such a lovely reflection on Marianne’s character, Nicole. I thought you explained your reasoning for her being, in fact, a Rational Creature beautifully. Marianne does indeed undergo a huge change as a person. She’s forced to reevaluate her behaviour and ends up making the sensible, but also the right choice. I look forward to reading her story as written by you in the anthology! I hope you enjoy her, Elaine! It was a treat for me to spend some time with her. It was funny how she just took hold of the story and told me exactly who she was and what she was all about! Real Life, and our family having to make a truly horrible ‘rational’ decision recently, have prevented me from following the more recent stops on the tour, so I’m playing catchup right now. Thanks for such a thought-provoking post, Nicole. For a long time, Marianne irritated me no end. Such outpourings of emotion, with apparently no consideration for what anyone else might be feeling. I really felt for Elinor and her situation (though Edward Ferrars has never been a favourite of mine). I think I probably mapped their relationship on to the one I had (and still have to some extent) with my own sister – I’m very much an Elinor and she, especially when she was growing up, was much more like Marianne. Now we’re both very much older, I’m less reserved and she has become more of a rational creature. Turning Marianne into a Rational Creature must have been a real challenge, Nicole and I’m sure you’ve risen to the challenge magnificently. I understand about not sympathizing with Marianne. She is just so MUCH of everything! So much emotion, so much recklessness. I think it is helpful to remember how very young she is, and that her mother had encouraged her in her folly. All the training and wisdom that most of us receive from older women and mentors was really not there for her until she was able to watch her sister walk through the fire, and do it better than she. Marianne always baffled me. I couldn’t relate neither to her beginning nor to her end. Then my uber-dramatic, never-does-anything-by-halves daughter came along, and I think i can at least try to get her… you insightful analysis certainly helps! Oooh, I have one of those, too! I try… goodness knows, I try… but I guess they need to learn some things the hard way, right? I guess that made Marianne easier for me to understand as well! Thanks for stopping by, Rachel! I have so enjoyed the Anthologies from Quill Press, and Rational Creatures will also be a winner. I also enjoy Nicole’s writings. What a giveaway! Thank you so much, Eva! I know you will enjoy this one! Such an unspoiled romantic like Marianna Dashwood was to my imagination a far length away of being rational. But dissappointed hopes and dreams changes us women, does it not?! Jane’s beautiful stories and the variations by fabulous writers may have come late to my attention, but I can’t get enough of them. This book is one I’d love to read someday, please considder me a part in this giveaway, thank you! Very well said, Nicole. I agree that she wasn’t rational when S&S began became one at the conclusion of the novel. I’m delighted that all authors in this anthology give equal treatment to the ladies written by our dear Jane Austen whether they are heroines, villains or minor characters.